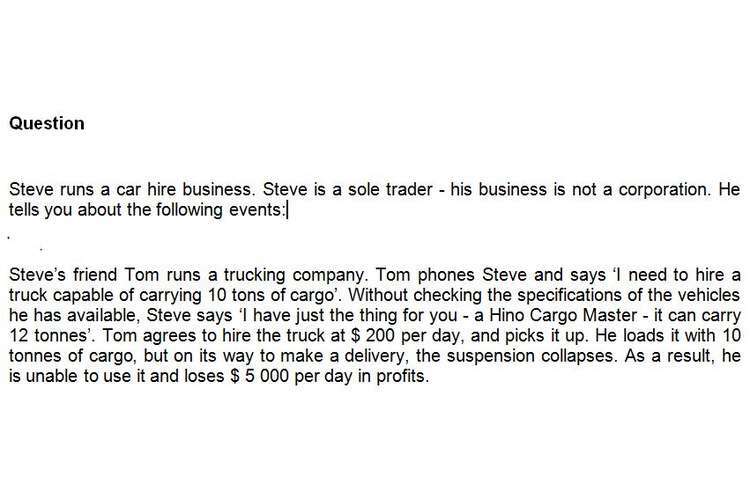 Steve’s friend Tom runs a trucking company. Tom phones Steve and says ‘I need to hire a truck capable of carrying 10 tons of cargo’. Without checking the specifications of the vehicles he has available, Steve says ‘I have just the thing for you - a Hino Cargo Master - it can carry 12 tonnes’. Tom agrees to hire the truck at $ 200 per day, and picks it up. He loads it with 10 tonnes of cargo, but on its way to make a delivery, the suspension collapses. As a result, he is unable to use it and loses $ 5 000 per day in profits. Pamela has often watered Steve’s garden when he (Steve) has been away on holiday. Pamela phones Steve and says ‘I’ve got a problem - my car is being fixed and I am going on holiday tomorrow, but I can’t afford to hire one. Can you help me out?’. Steve says ‘Sure - you looked after my garden last month, so I’ll lend you a car for the weekend because you did that’. When Pamela comes to collect the car, however, Steve tells her that he hired it to another customer. Pamela says that Steve has broken the contract she had with him and that she will be consulting a lawyer. Danny telephones Steve and says ‘I would like to hire the Toyota Corolla I used last week’ Steve says ‘The charge will be $ 40 per day plus fuel and you can collect the car tomorrow’. Danny says ‘That’s great, I will be there at 9 am’. When Danny arrives at the car lot, Steve says that when he had been speaking to Danny, he was unaware that the vehicle had already been destroyed in a crash while being driven by another customer the previous day. Danny refuses to take a different car and says he will go to court to enforce the contract he had with Steve. Steve is thinking of putting in a new air-conditioning unit in his premises. He has been in negotiations with Cool It Aircon Ltd, owend by Trisha. One Monday morning he comes into his office and sees the latest draft contract from Cool It Aircon, with details of specifications of the airconditioners, price and installation date. The top sheet of the contract contains a space which says “I agree to these terms of supply” and with a space for a signature and date. Steve sets the contract aside on his desk, and it soon gets mixed up with piles of other paperwork. Later during the day, he signs the form, thinking that it was the front page of another contract he had been sent by a supplier of microchips. He gives it to his office manager, Tim, and says “Send this by fax”. A few days later a truck from Cool It Airon arrives at Steve’s business. Steve phones Trisha and says he never agreed to the installation. When Trisha tells him about the fax, he realizes his mistake and tells her that he had sent it by accident. She says “Too bad, we have a deal – I have already spent several thousand dollars making customized components for your system”. Advise Steve on his legal position in relation to each transaction, backing up your answers with relevant rules of law.